CD reviewing is something of a lottery for smaller reviewing outlets. MusicWeb reviews 100 - 250 Classical CDs each month and Gramophone offers reviews of 140+ discs next month, but experience shows that there are glaring omissions, and some musicians find it hard to get reviews. Many discs reach us every week, some unsolicited from individuals and from record companies, some of those sending us all their releases for consideration, whilst appreciating that we cannot cover every one. We do, however, sample at least every disc received, but do not review all those for which our opinions would be unhelpful to all concerned. From monthly lists circulated by distributors, some of them dauntingly massive, we ask a few of each, choosing prejudiced in favour of unfamiliar music that we don't know. Inevitably, many worthy productions are missed. With the smaller record companies, it is more problematic. Hyperion maintains high standards both in their new releases and in re-releases on their Helios budget label (we consider that re-releases are equally important to our readers, some of them cash-strapped in the recession). This month we have three of five requested to consider (we will have to seek elsewhere for opinions about Hyperion's Stravinsky and the Helios Tartini re-release). The three we do have raise interesting critical considerations. Hindemith's complete solo viola sonatas (Lawrence Power) [Hyperion CDA67769] is one for those collectors who like to amass intégrales. Paul Hindemith was a great violist (he premiered Walton's concerto) and he could play well every other orchestral instrument too! Power is one of the finest of the many violists now before the public, vying for attention of record collectors. This is therefore for violists a self-recommending set, but less so for ordinary collectors. These sonatas go better individually in mixed programmes. Some of the music is, frankly, gruff and dour; most approachable the last one (1937), written fast on a train journey to Chicago and completed by his arrival there to premiere it the very same day ! Hindemith's language had by then become "more warmly emotional, even romantc again" (Malcolm MacDonald in his comprehensive notes). 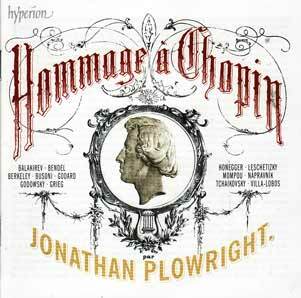 Jonathan Plowright's Chopin Homage [Hyperion 67803] for the composer's 200th birthday (22 February 1810 - same date as my own!) is far more to my taste, illustrating Chopin's all pervading importance as recognised by very many composers, some of them now obscure. The gems are substantial sets of varations by Busoni and Mompou, and for British collectors three by Berkeley - but none of Szymanowski's, I wonder why. Extensive notes by jeremy Nicholas and a lovely cover. I am strongly prejudiced (for concerts and for recordings) in favour of imaginitvely conceived programmes, and this is one. But the greatest pleasure (and a complete surprise) is a wonderful disc of Baltic choral music by Praulinš, Einfelde, Sisask & Miškinis, given by Cambridge's Choir of Trinity College under Stephen Layton [CDA 67747]. 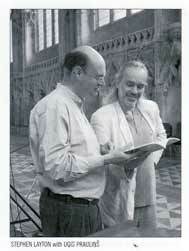 The main work is a terrific Missa Rigensis by musical polymath Ugis Praulinš, one time sound engineer, latterly composer for films, TV, "crossover", ballet and concert (pictured with Stephen Layton). It is a fresh working of the familiar text in "an integrated musical language - - referential yet completely personal" (Gabriel Jackson). Of the other composers, Einfelde's cycle was a welcome reminder of her participation in the last of Richard Steinitz's Huddersfield Festivals, 2000, and of the too-separate world of choral music in which we have immersed ourselves at Festivals at Cork and in Bavaria. This disc is a labour of love, the music is superbly sung by the lusty young voices of about thirty Cambridge choral scholars (many of them, I believe, not studying music as main subjects) and was sumptuously recorded in Ely Cathedral summer 2008. The recording details (once you can locate them!) do not tell whether there was a Baltic lanuages coach? We'll have to take that on trust. But don't miss this CD.